TALLAHASSEE, Fla. -- Christmas is over, and many people are trying to get rid of their Christmas trees. 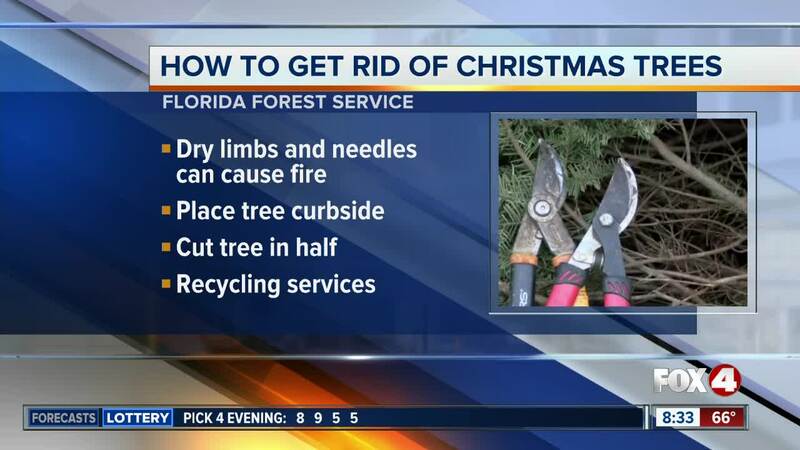 The Florida Forest Service is encouraging safe to dispose your tree without posing a fire hazard. There are three things you can do with your Christmas tree: throw it away, recycle it or burn it. The Florida Forest Service said dry limbs and needles from a discarded Christmas tree can be a serious fire risk. If you decide to dispose it, place your tree on the curb for trash pickup and make sure to remove all the decorations. Trees taller than 6 feet need to be cut in half. If you want to recycle it, many communities offer tree recycling services. Check your city or county government or utility service for that information. · Check local ordinances for county burn bans and requirements for outdoor burning. · Burn only if significant rainfall has occurred in the last three or four days. · Never burn on dry or windy days. · Select a burn location that is at least 25 feet from natural areas, 25 feet from your home, 150 feet from other occupied buildings and 50 feet from any paved public roadway. · Remove all decorations from the tree before you burn. · Cut the tree into manageable sections, as necessary. · Clear the burn area free of other flammable materials, such as leaf litter and pine straw. · Keep a shovel and water hose handy in case the fire starts to escape containment. · Never leave a fire unattended, and make sure it is out before leaving. · Never burn a Christmas tree in a fireplace or wood stove.